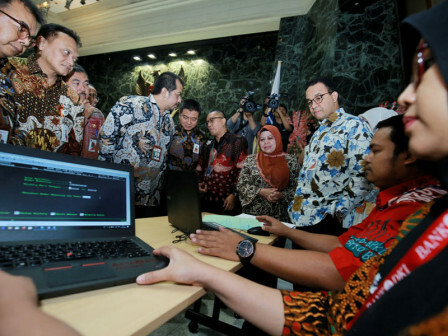 Jakarta Government launches its new innovation, Fund Disbursement Order (SP2D) as regional expenditure payment and central tax payment system which is done online and real time.
" Now, regional expenditure and central tax payment can be done online and real time using this system"
"This innovation is the first in Indonesia. Now, regional expenditure and central tax payment can be done online and real time using this system," said Anies Baswedan, Jakarta Governor at City Hall's Balai Agung (Great Hall),Thursday (1/31). He assessed, accountability of regional expenditure transaction and tax management can be better and more efficient if it is done in real time and online. "It will be wonderful if we can implement this system in all Jakarta SKPDs and UKPDs," he expressed. Currently, this system is only applied for expenditure. Soon, he plans to try this system for other aspects. "This is a result of our cooperation with DKI Bank and Directorate General of Taxes. So, we hope it can be applied for other aspects," he stated. Jakarta Financial Management Agency (BPKD) Head, Edi Sumantri conveyed, his side has given training and socialization regarding SP2D usage to his subordinates in five Jakarta regions. "It continues with soft launching of central tax payment online system through SP2D," he stated.